John Bolton was on the Daily Show today for the third time, and is a nice reminder of the foreign policy that the United States has thankfully left behind. There's something odd about a former ambassador that is simply incapable of seeing any sort of minutiae in a situation like the current one in Iran, in the way he keeps presenting theoretical situations: either Iran gets a nuclear bomb or Israel comes in and stops them. Anyone paying attention to the situation within the country knows that the protests are showing no signs of abating, rifts within hardliners are growing, Ahmadinejad is looking weak and may not even get a cabinet through the Majlis, and who knows what the scope of the protests will be on the 3rd (when Khamenei is to officially endorse AN) and the 5th (when AN is supposed to be inaugurated). The idea that Iranians would simply shrug their shoulders at a strike from Israel is also laughable. I think it's far too late for Iranians to rally behind the regime (that might have happened before the election) in such an event, but it would certainly serve to change the subject for at least a few months, and that would be a terrible result. 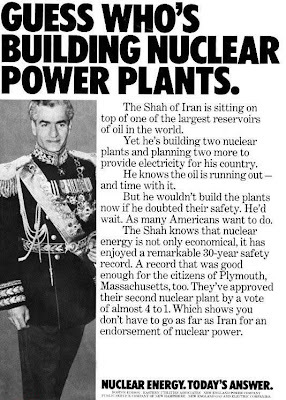 Also, note that the US isn't necessarily opposed to Iran acquiring nuclear power, just as long as the government is thought to be sane and stable enough. After all, the US certainly didn't mind before. And no, it wasn't simply from the Shah being so close to the US - Pakistan has not just nuclear power but also nuclear weapons, and they are receiving US aid. I suspect a theoretical Iran headed by Montazeri, with Mousavi as President and let's say Shirin Ebadi as VP (that's my ideal situation) could certainly develop nuclear power and the world wouldn't care all that much, especially if there happened to be some progress in relations with Israel.